UPDATE: Koda had surgery and is home recuperating – thank you to all that donated. Tuesday night my 9 yr old took our 4 yr old Newf outside to go potty before bed. Koda saw something in the yard and took off after it. In the time it took my daughter to walk inside and tells us that Koda had taken off and my son putting his shoes on Koda was hit by a car and left in the ditch to die. She was less than 20 feet from the driveway. They didn’t slow down or even try to stop. We took Koda to the emergency vet for treatment. I spent everything I had saved up for my kids Christmas to have her treated but still didn’t have enough to cover her surgery to repair her fractured femur. She has bruised lungs which caused some bleeding into her lungs and required her to be on oxygen. I had to bring her home and do round the clock oxygen and pain meds plus flip her every 4 hours to keep pressure off her lungs. When we brought her home she parked right up and was so happy to see all her kids and she even licked (kissed) my 9 yr old as if telling her that she was going to be ok and she wasn’t mad at her. She doesn’t ever give lick kisses so this was big for her. We have been able to get her to eat and drink which the vet said she wouldn’t do there. We don’t want to give up and put her down but we are about out of time to do the surgery to fix her leg. She isn’t a candidate for amputation because she has the starts of hip dysplasia and arthritis in her knee. We are afraid we may have to put her down if we don’t raise enough money to cover her surgery. We rescued Koda almost 4 yrs ago after the people who bought her threw her out on the side of the road the week between Christmas and New Years. She was between 3 and 4 months old. The dog warden tracked them down thinking she had gotten lose and was lost. They told the dog warden that they didn’t want her because she was getting too big and she wouldn’t quit chewing stuff up. 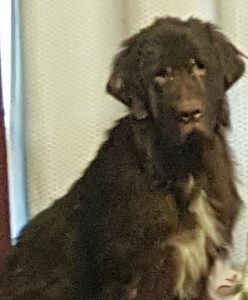 The dog warden knew we had another newf mix that was almost 7 at the time and asked me to adopt her so he knew she wouldn’t end up back there or on the streets again. It took us almost a year to get her to fully trust us and even go near a car without wetting herself. She has become another child to us and we can’t stand to see her suffering. I know its Christmas time and we are hoping for a Christmas miracle to be able to save her and her live out the rest of her life happy and healthy.